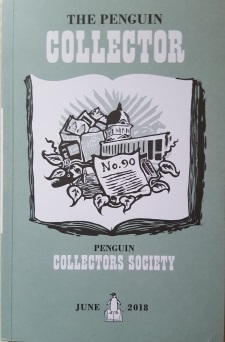 The Penguin Collector is the Society's twice-yearly journal, published each June and December. Its forerunner, The PCS Newsletter, began in 1974, soon after the Society was inaugurated and ran for forty issues. It became The Penguin Collector in December 1993 with Collector 41, and is produced in a format which pays homage to Penguin design. It is now illustrated in colour throughout. Articles are contributed by members and other writers on a wide range of Penguin-related matters. They are full of information and interest, the result of sharp-eyed observation, detailed research and careful editorial verification. Collector 90 (June 2018) includes a piece by Sian Heap, the 2017 Bursary winner, on Penguins and reading habits during the Second World War, then a tale from the archive of the difficult gestation but successful birth of a Baby Puffin. Its centrepiece is a major article by Paul Lickiss on The Pelican History of Art. That is followed by reviews of five books with links to the Penguin story. Each Collector also contains a multitude of shorter pieces. ‘Penguin Points’ enable members to raise all sorts of matters of interest and to seek information from the membership at large about some of the many mysteries of Penguins' publishing history; ‘Penguin Places’ suggest bookshops worth visiting in the unending quest for old Penguins; ‘Penguins in Penguins’ report appearances of Penguin books in literature and art; and anecdotes about ‘The Penguin Collector's Lot’ give reassurance that none of us is alone in this quest. The Collector concludes with news of the Society's activities, from reports on meetings and visits, to plans for future events and updates on the programme of publications. If you have something which could be considered for publication, however long or short, however much it is a preliminary draft or a finished article, do please contact the Editor. Browse or buy back-issues of The Penguin Collector. Read a selection of articles written by or for The Society.